Made of lightweight aluminum for a strong and long lasting weapon that is light and easy to carry in pocket or purse. This tapered kubotan has a steel keyring and designed with contours to enhance grip. This way you can make your fist into a metal mad nightmare for your opponent. 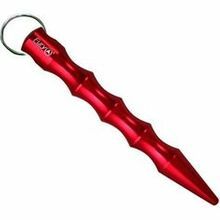 You can have your keys as an extra striking surface as well as the business ends of the kubaton. You can apply to pressure points and throw strikes without changing your grip. You can inflict more damage, more quickly and escape the attack.